Lubuntu 11.04 released; project on the way to official Ubuntu spin status - OMG! Ubuntu! The latest version of the lightweight, LXDE based Ubuntu derivative Lubuntu has been officially released. Having held a lot of love for the lightweight non-official variant of Ubuntu during the last few cycles, the question is: "Is it much cop this time around?" That depends on what you’re looking for. Lubuntu’s ‘traditional’ interface will be of comfort to those agitated by the interface revolution heralded in GNOME 3 and Ubuntu Unity; it certainly won’t appeal to "bling" fans! But that’s not to say attention hasn’t been paid to the appearance. The new default theme by Raphael Laguna and the use of the Ubuntu font helps to give the sometimes-basic-feeling OS a distinctly professional look. Lubuntu 11.04 will feel more than familiar to users of releases past, with an iterative upgrade of desktop applications that remain resourceful on system hardware but more than capable alternatives to bigger, more established applications. Covering the ‘vitals’ of any modern desktop are Chromium as the default web browser, Sylpheed as the default mail application and Pidgin as the default messaging client. 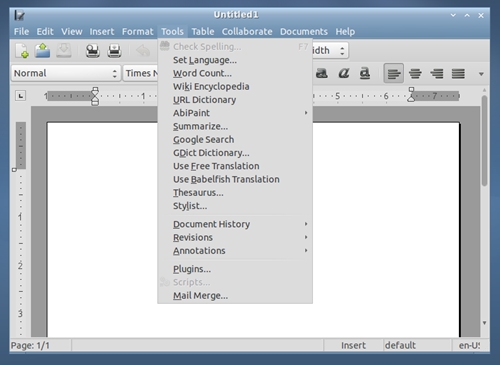 In place of LibreOffice are AbiWord and GNUmeric – two very capable office applications. Audacious now sits as the default audio player, replacing the dated Aqualung. Neither of these applications are going to win a beauty pageant. Likewise neither do much outside of simply ‘playing’ music. Elsewhere in Lubuntu 11.04 webcam booth ‘Cheese’ has been replaced with Nixie Pixel’s favourite app GUVCView, and archives are now extracted using GNOME’s file-roller. As with all "final" releases of Lubuntu this release is to be considered a ‘stable beta’ and not a ‘stable’ release of itself. Lubuntu has long sought official sanction from the Ubuntu Project family to be classed as an official ‘derivative’ of Ubuntu, earning a place alongside Kubuntu and Xubuntu. With such an accomplished release as Lubuntu 11.04 the hold out on acceptance remains disappointing if expected. Thankfully the dedication and hard work of the Lubuntu development team is paying off. "The fact that you are now 100% in the archive, and using PPA’s and other tools effectively, makes it possible for us to consider recognising Lubuntu as an official part of the [Ubuntu] project. "